At Conklin & Ward Dental Group, we’re dedicated to making every part of your dental experience more efficient and comfortable. 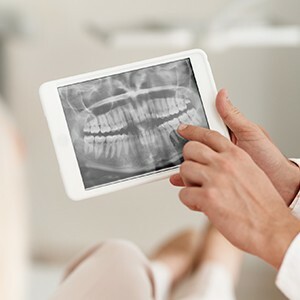 With our advanced imaging technology, we’ll be able to actually show you what we’re talking about so you can better understand your care, and with our sedation techniques, we can help those dental nerves quickly melt away. We continually update our office with the latest technology to ensure that your care with us is always high-quality, precise, and dare we say, relaxing! This device allows you to finally see your smile from your dentist’s perspective. This small, pen-sized camera can be easily maneuvered through the mouth to capture high-resolution images of the teeth and gums that can be displayed on a large chairside monitor. These will help our team catch dental issues even earlier, plus it will help us better explain why we might be recommending a particular treatment. It helps take some of the mystery out of your dental care! When compared to traditional, film-based X-rays, digital X-rays are an improvement in just about every way you can imagine. They can create crystal clear images almost instantly, and they don’t require toxic darkroom chemicals to be developed. Plus, they expose our patients (and us!) to 90% LESS radiation in the process as well. And, the images can be easily sent, stored, and displayed on a nearby monitor for you to view with your dentist.